in Google search results for a while now. Starting today, we’re bringing App Indexing to iOS apps as well. This means users on both Android and iOS will be able to open mobile app content straight from Google Search. If you happen to be attending Google I/O this week, stop by our talk titled “Get your app in the Google index” to learn more about App Indexing. You’ll also find detailed documentation on App Indexing for iOS at g.co/AppIndexing. If you’ve got more questions, drop by our Webmaster help forum. We’ve been helping users discover relevant content from Android apps in Google search results for a while now. 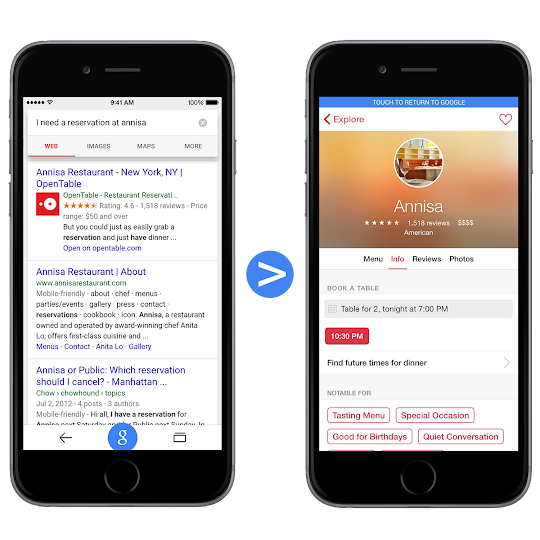 Starting today, we’re bringing App Indexing to iOS apps as well. This means users on both Android and iOS will be able to open mobile app content straight from Google Search.